A rectangular porcelain plaque finely enamelled in delicate hues with a magpie seated on a branch at the top of a blossoming plum tree. The magpie, with recognisable black and white feathers and a long tail, has its beak open as if singing. Various open plum blossoms are painted in graduated pinkish red colour, whilst the greyish tree branches extend towards to the sky. This porcelain plaque expresses one of the most popular painting subjects in Chinese culture. Known as the ‘bird of joy’ or ‘bird of happiness’, the magpie (xique) is a popular motif especially for weddings. According to ancient beliefs, magpies are birds of prophecy that can tell things beforehand. A chirping magpie on a blossoming plum tree means ‘joyfully announcing the arrival of spring’ (xibao chunxian). The subject represents happiness in springtime and rejuvenation in old age, because the plum is the first tree to bloom in late winter and early spring, when the dead-looking bare branches burst into bloom. The subject is depicted in ink painting by famous artists around the same time, such as Qi Baishi (1864 – 1957) and Xu Beihong (1895 – 1953). Porcelain artists were committed to transplant Chinese ink painting from paper to porcelain. During the late Qing dynasty and Republic of China period, many porcelain painters were gathered in Jingdezhen, Jiangxi province. 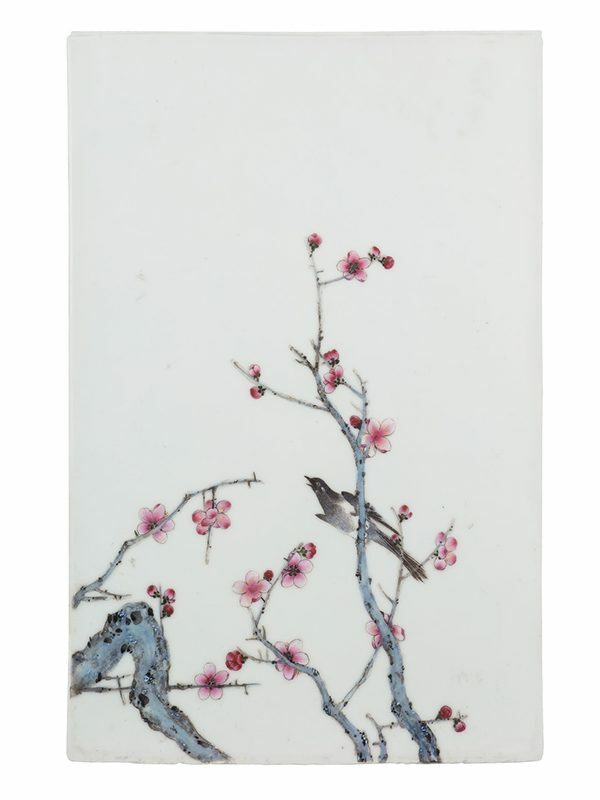 Three comparable porcelain plaques, similarly depicting birds on branches of plum blossom trees, are illustrated in Pian Xie Shan Fang Cang Ci (Porcelain Collection in the Pian Xie Retreat). Provenance: This plaque was bought in Mexico. It comes from the collection of a lady who died in her 90’s. It is documented that the works of Pan Yongbing (1900-1961), an artist of ceramic fine arts and a native of Boyang county, Jiangxi Province, were exhibited in Panama in the 50’s. The works of many Chinese ceramic artists were included in exhibitions in Central and South America in the 1950’s and 1960’s, so it is likely that this plaque was bought at a local exhibition at that time and subsequently stayed in Central America.